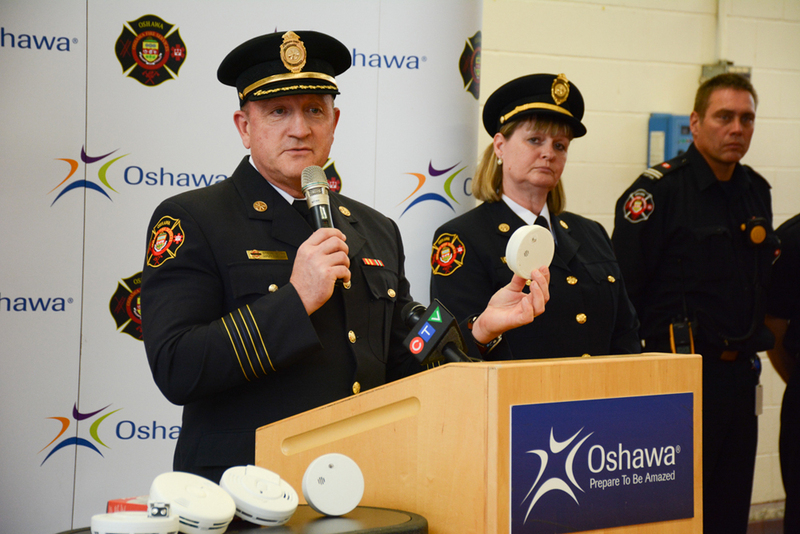 Oshawa Fire Services deputy chief Steve Boyd holds up a smoke alarm during a press conference earlier this year. Oshawa Fire Services is getting ready to spread the word this summer. As part of the Alarmed for Life campaign, Oshawa Fire Services will be out in the community to provide information on household fire safety. The door-to-door visits are for educational purposes and voluntary. Those who participate will receive a booklet that includes information and tips on smoke alarms, carbon monoxide alarms, fire extinguishers, home escape planning and emergency preparedness. Firefighters will also provide information and answer questions on fire safety. Oshawa Fire Services does not solicit via telephone and does not work with any private companies; they only send uniformed members with City of Oshawa employee identification badges to peoples’ homes. Residents should contact Durham Region Police Service at 905-579-1520 and report phone calls received or individuals who are not in uniform or do not have City of Oshawa identification badges who go door-to-door saying they are with Oshawa Fire Services and need to check their carbon monoxide alarms. Alarmed for Life is an annual provincial initiative. Oshawa’s door-to-door program runs from June until October, with firefighters visiting approximately 9,000 Oshawa homes each season.